HELLO LOVELY READERS! I realise it's been a while since I posted a recipe here but I'm hoping you've all been too busy happily cooking from Ostro (the book) to be worried!! It's been an amazing few months since it's been released and I am so over the moon with joy to have it in your homes and in your kitchens! If you haven't seen it floating around, you can read a little more about it here or find it in most good bookstores, especially lots of the independent ones! If you can't see it in your favourite store, they can order it (and more copies) in – it all makes such a big difference. A little behind the scenes shot of some of the amazing team who put Ostro together! 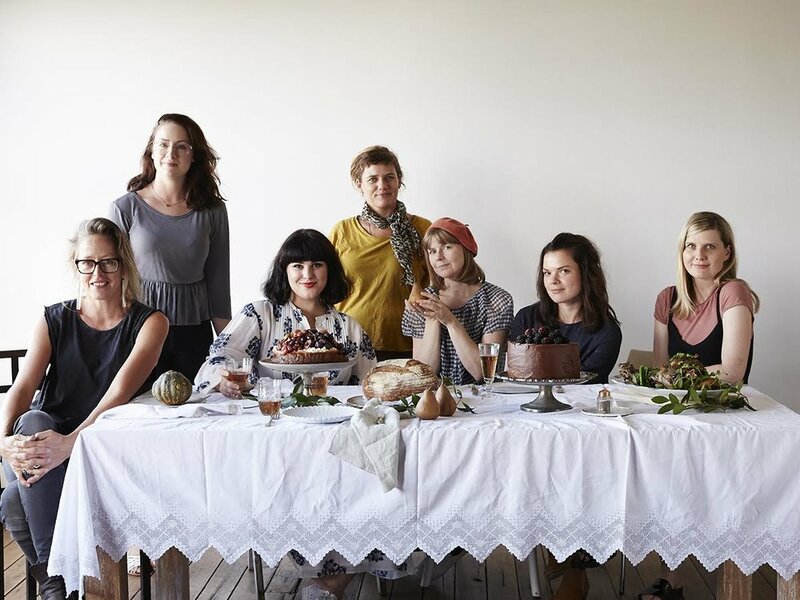 L-R: Armelle Habib (Photography), Stephanie Rooney (Photography Assistant), Me :), Emma Warren-Rodriguez (My amazing food assistant/right hand woman in the kitchen), Michelle Mackintosh (Book design), Karina Duncan (Stylist), Clare Marshall (Editor). Missing, my amazing publisher Mary Small and Publicity Manager Charlotte Ree. GIRL POWER!! Some of my biggest food idols have gotten their hands on a copy and it's a rather lovely feeling. I really hope you are all loving it too. I wrote it for YOU! Today I'm sharing a nice cake for spring. I posted the recipe on my Instagram so you may have already seen it. A soft and sweet and slightly sour cake, wonderful for using lots of your spring rhubarb. Best made with young, tender and thin stalks which are abundant at this time of the year. I'm often hesitant to cook with white chocolate, but here, with the sour rhubarb, it all seems to balance out well. 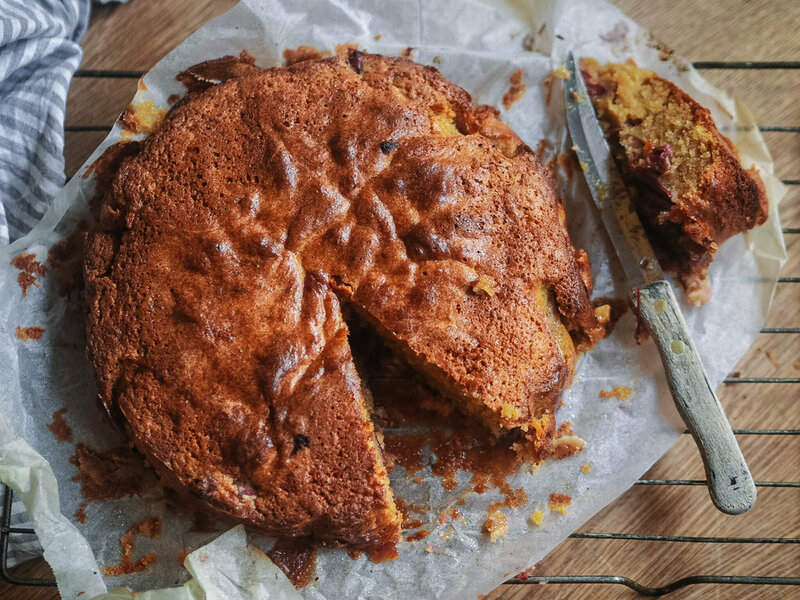 The chunks mostly fall to the bottom of the cake, along with the rhubarb where it all slightly caramelises and become oh so delicious. If you've been cooking from Ostro, I would love to hear about. Please do leave me a comment below! Preheat the oven 180C. Grease and line a 21cm round cake tin. Beat butter with the sugars until pale and fluffy. Drizzle in the vanilla extract then add in 3 eggs, one at a time, mixing well after each addition. Mix in the sour cream then gently fold in the self raising flour. Stir in the chopped white chocolate and the pieces of rhubarb. Pour into your prepared tin tin and bake for 45-50 minutes or until the centre of the cake springs back when gently pressed. Cool briefly in the tin then transfer to a wire rack. Serve warm or at room temperature.